This is another one of those recipes that we’ve made a zillion times and we’re only now getting around to blogging about it. And with that we would tuck into our bowls full of yummy noodle-y goodness and you would all unknowingly be kept in the dark for another couple of weeks before we made it again. Until today, that is, because we finally managed to snap a few photos for you! We found these really cool spinach vermicelli noodles at the No Frills (sometimes that place surprises us!) and they are what originally inspired this dish. We’ve also made it with regular vermicelli noodles, and it would probably work really well with other types, too, like angel hair pasta, for instance- whatever you happen to have on hand, basically. And the best part is that this dish is extremely simple! (Apparently our new Sunday tradition is leaking out into the rest of the week?) There’s basically 4 steps to creating this meal: cook the noodles, cook the fish and veggies, heat up the broth, dump everything in a bowl. Done and done! Melt coconut oil in frying pan over medium-high heat. With the first 3tsp of hoisin sauce, coat both sides of the fish fillets. Cook on both sides for 2-3min, or until fish is blackened and cooked through. Remove from pan and chop into bite-sized pieces. Fill a pot with about 3 cups of water and bring to a boil. Once the water is boiling, add the noodles and cook for 2-3min, or until soft. Strain and set aside. While water is heating, add some more coconut oil to your frying pan on medium-high. Add onions and garlic and saute until onions are translucent, then add the rest of your vegetables, except the kale. 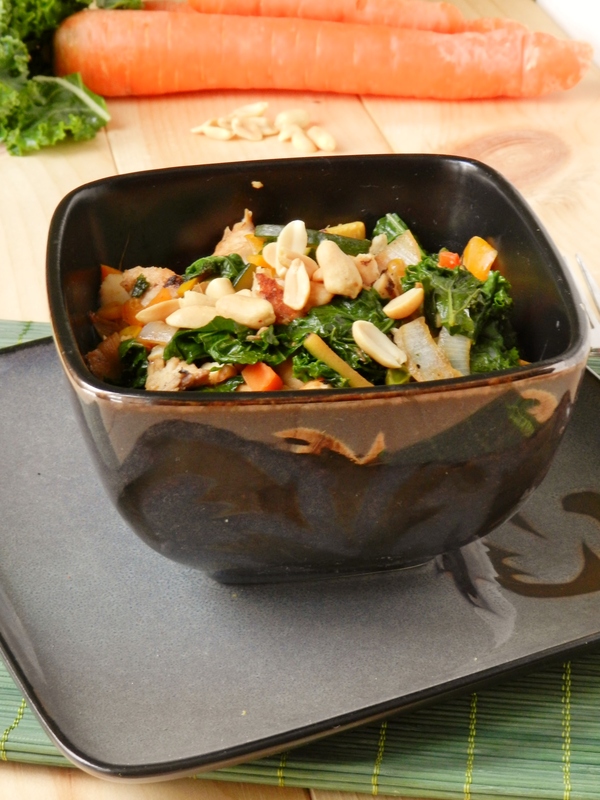 Once the vegetables have cooked down some (about 3min), add the kale, peanut butter, final tablespoon of hoisin sauce, rice vinegar and pepper. Stir in fish. In a separate bowl, heat stock in microwave (or in a pot on the stove, if you’d prefer) until hot. Divide noodles between two bowls and put fish and vegetable mixture on top. 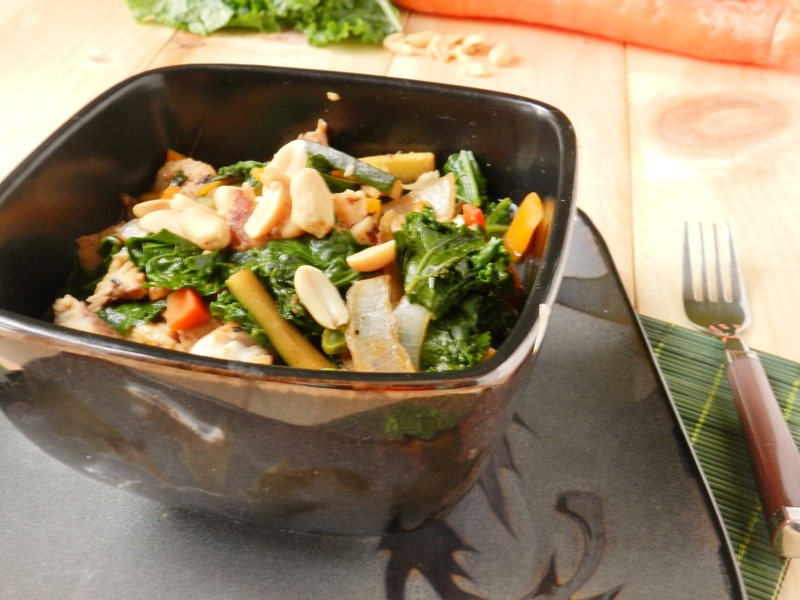 Pour hot vegetable stock over the noodles and vegetables, top with peanuts and hot sauce (if desired) and serve. 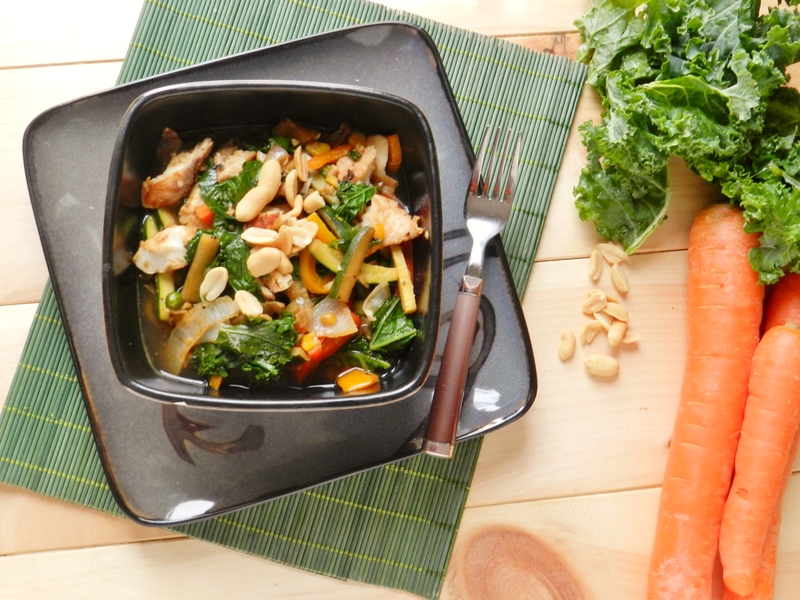 *For our vegetables, we used peppers, zucchini, frozen mixed vegetables and mushrooms. ** Vermicelli noodles typically come in several bunches in a bag. Posted in Uncategorized and tagged angel hair pasta, clove garlic, coconut oil, dinner, easy, food, healthy, hoisin sauce, noodle, noodle bowl, quick, szechuan, vegetarian, white fish. Bookmark the permalink. I have the same conflict with pics! I want to eat my food… self-control is not a virture I possess. LOL! This dish sounds right up my alley – peanut sauces are the best! Hahaha sometimes it looks and smells just too good – and we’re just too hungry haha 🙂 And aren’t they though? We’re convinced peanut butter is the perfect food, it goes well with EVERYTHING!